(1) Employer’s contribution rate. Each nonprofit organization which is or becomes an employer subject to this chapter shall be subject to all its provisions except as it may elect reimbursement financing in accordance with sub. (2). If such an approved election is terminated, the employer’s contribution rate shall be 2.5 percent on its payroll for each of the next 3 calendar years. (a) It shall file a written notice to that effect with the department before the beginning of such year except that if the employer became newly subject to this section as of the beginning of such year, it shall file the notice within 30 days after the date of the determination that it is subject to this chapter. (b) An employer whose prior election of reimbursement financing has been terminated pursuant to sub. (3) may not thereafter reelect reimbursement financing unless it has been subject to the contribution requirements of ss. 108.17 and 108.18 for at least 3 calendar years thereafter and is not, at the time of filing such reelection, delinquent under s. 108.22. (c) No election of reimbursement financing shall be valid unless the employer has satisfied the requirements of sub. (4) within 60 days after it filed the notice of election. (d) Sections 108.17 and 108.18 shall apply to all prior employment, but after all benefits based on prior employment have been charged to any account it has had under s. 108.16 (2) any balance remaining therein shall be transferred to the balancing account as if s. 108.16 (6) (c) or (6m) (d) applied. (b) The department may terminate any election as of the close of any calendar year if the department determines that any of the following applies. 1. The employer has failed to make the required reimbursement payments. 2. The employer has failed to pay the required assessments authorized by sub. (7) or s. 108.155. 3. The employer no longer satisfies the requirements of sub. (4). 4. Section 108.16 (8) applies with respect to the employer. (a) An employer electing reimbursement financing shall file an assurance of reimbursement with the fund‘s treasurer, payable to the unemployment reserve fund, guaranteeing payment of the required reimbursement together with any interest and any tardy filing fees. The assurance shall be a surety bond, letter of credit, certificate of deposit or any other nonnegotiable instrument of fixed value. 1. The amount of assurance shall be equal to 4 percent of the employer’s payroll for the year immediately preceding the effective date of the election, or the employer’s anticipated payroll for the current year, whichever is greater as determined by the department, but the assurance may be in a greater amount at the option of the employer. The amount of the assurance shall be similarly redetermined prior to the beginning of the 3rd year commencing after the year in which it is filed and prior to the beginning of every other year thereafter. 2. Prior to the beginning of each year, an employer electing reimbursement financing shall file an assurance for the 4-year period beginning on January 1 of that year in the amount determined under subd. 1. An assurance shall remain in force until the liability is released by the fund’s treasurer. 3. No assurance may be approved unless the fund’s treasurer finds that it gives reasonable assurances that it guarantees payment of reimbursements. 4. Failure of any employer covered by the assurance to pay the full amount of its reimbursement payments when due together with any interest and any tardy filing fees shall render the assurance liable on said assurance to the extent of the assurance, as though the assurance was the employer. (b) The fund’s treasurer shall issue a receipt to the employer for its deposit of assurance. Any assurances shall be retained by the fund’s treasurer in escrow, for the fund, until the employer’s liability under its election is terminated, at which time they shall be returned to the employer, less any deductions made under this paragraph. The employer may at any time substitute assurances of equal or greater value. The treasurer may, with 10 days’ notice to the employer, liquidate the assurances deposited to the extent necessary to satisfy any delinquent reimbursements or assessments due under this section or s. 108.155 together with any interest and any tardy filing fees due. The treasurer shall hold in escrow any cash remaining from the sale of the assurances, without interest. The fund’s treasurer shall require the employer within 30 days following any liquidation of deposited assurances to deposit sufficient additional assurances to make whole the employer’s deposit at the prior level. Any income from assurances held in escrow shall inure to and be the property of the employer. (a) For each nonprofit organization which has elected reimbursement financing, pursuant to sub. (2), the fund’s treasurer shall maintain a reimbursement account, as a subaccount of the fund’s balancing account. (b) The department shall charge the employer’s reimbursement account with all regular benefits, and with its share of any extended benefits under s. 108.141, based on wages paid within each quarter ended while its election is in effect. (c) The employer’s reimbursement account shall be credited with any reimbursement paid by or for it to the fund, and with any benefit overpayment from the account recovered by the department. (d) The employer may at any time make other payments to be credited into its reimbursement account, in anticipation of future benefit charges. (e) Whenever the employer’s reimbursement account has a positive net balance no reimbursement of the benefits charged thereto shall be required. (f) Whenever an employer’s reimbursement account has a negative balance as of the close of any calendar month, the fund’s treasurer shall promptly bill such employer, at its last-known address, for that portion of its negative balance which has resulted from the net benefits charged to such account within such month. Reimbursement payment shall be due within 20 days thereafter. Any required payment which remains unpaid after its applicable due date is a delinquent payment. Section 108.22 shall apply for collecting delinquent payments. (a) They shall be so treated for at least the 3 calendar years following their request, unless their election of reimbursement financing is terminated under sub. (3), but they may discontinue their group arrangement as of the beginning of any subsequent calendar year by filing advance notice with the department. A member of such a group may discontinue its participation in the group and the group shall be dissolved at the beginning of any calendar year after the 3rd year. (b) They shall be jointly and severally liable for any required reimbursements together with any interest thereon and any tardy filing fees. (c) They shall designate one or more individuals as agent for all members of the group for all fiscal and reporting purposes under this chapter. (d) If such a group is discontinued, par. (a) shall apply to each of its members. 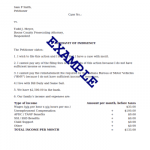 (a) In this subsection, “payroll” has the meaning given in s. 108.02 (21) (a). (b) Except as provided in par. (f), each employer that has elected reimbursement financing under this section and that is subject to this chapter as of the date that a rate of assessment is established under this subsection shall pay an assessment to the fund at a rate determined by the fund’s treasurer under par. (c). (c) The fund’s treasurer shall determine the total amount due from employers electing reimbursement financing under this section that is uncollectible as of June 30 of each year, but not including any amount that the department determined to be uncollectible prior to January 1, 2004. No amount may be treated as uncollectible under this paragraph unless the department has exhausted all reasonable remedies for collection of the amount, including liquidation of the assurance required under sub. (4). The department shall charge the total amounts so determined to the uncollectible reimbursable benefits account under s. 108.16 (6w). Whenever, as of June 30 of any year, this account has a negative balance of $5,000 or more, the treasurer shall determine the rate of an assessment to be levied under par. (b) for that year, which shall then become payable by all employers that have elected reimbursement financing under this section as of that date. (d) The rate of assessment under this subsection for each calendar year shall be a rate, when applied to the payrolls of all employers electing reimbursement financing under this section for the preceding calendar year, that will generate an amount that equals the total amount determined to be uncollectible under par. (c), but not more than $200,000 for any year. (e) Except as provided in par. (f), the rate of each employer’s assessment under this subsection for any calendar year is the product of the rate determined under par. (d) multiplied by the employer’s payroll for the preceding calendar year, as reported by the employer under sub. (8) or s. 108.15 (8), 108.152 (7), 108.17 (2) or 108.205 (1) or, in the absence of reports, as estimated by the department. (f) If any employer would otherwise be assessed an amount less than $10 for a calendar year, the department shall, in lieu of requiring that employer to pay an assessment for that calendar year, apply the amount that the employer would have been required to pay to the other employers on a pro rata basis. (g) The department shall bill assessments to employers under this subsection in the same manner as provided in sub. (5) (f) for the month of September in each year, and the assessment is due for payment in the same manner as other payments under sub. (5) (f). If any assessment is past due, the department shall assess interest on the balance due under s. 108.22. If any employer is delinquent in paying an assessment under this subsection, the department may terminate the employer’s election of reimbursement financing under this section as of the close of any calendar year in which the employer remains delinquent. (h) If the payroll of an employer for any quarter is adjusted to decrease the amount of the payroll after an employment and wage report for the employer is filed under s. 108.205 (1), the department shall refund any assessment that is overpaid by the employer under this subsection as a result of the adjustment. (8) Reports. Each nonprofit organization that is an employer shall make employment and wage reports to the department under the same conditions that apply to other employers.